With just a little prep work and a good waterproofing stain, you can easily restore the beauty of your wood deck—perhaps even this weekend. 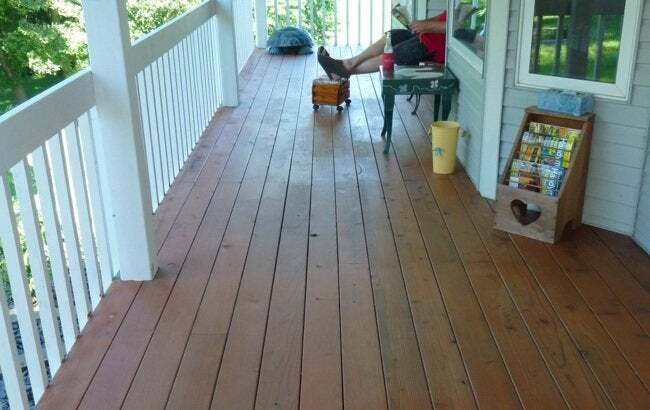 There are lots of ways to refinish a deck. If you want to showcase a fine wood species, such as mahogany, cedar, or redwood, a clear waterproofer is a good way to go. Some clear waterproofers don’t contain pigments or UV absorbers, so the wood can weather to a natural silver-gray over time. Others do, and will allow your wood to maintain its natural color. If your deck is bleached and faded, a tinted waterproofer (also called a toner) will renew the natural wood color. Like a clear waterproofer, it protects wood from water and resists fading and mildew. It also imparts a very subtle wood-tone tint. Thompson’s® WaterSeal® offers tinted waterproofers in both oil- and water-based formulations. The latter can be applied to new pressure-treated wood without waiting the 30 days typically recommended for oil finishes. I recently applied a coat of a semitransparent stain made by Thompson’s WaterSeal to a small deck and an outdoor bench. Unlike many other semitransparent stains, it both stains and waterproofs. It did a good job of blending tone variations and grain patterns, not unlike a wood stain for flooring or furniture. The coloring is not heavy, so the boards still look like wood. Thompson’s® WaterSeal® Waterproofing Stain comes in a three colors: cedar, desert brown, and nutmeg—and can be purchased only at Walmart. If you don’t want the wood look, choose a solid color deck finish. It will hide the wood grain and color completely, just like paint, but it’s not as thick and you don’t have to worry about peeling. Solid color stain allows you to connect your deck visually to the house by matching or complementing siding and trim colors. It has the most pigment of deck finishes (short of paint) and therefore offers the most UV protection. Regardless of which look you prefer, take the following steps to clean your deck before brushing or rolling on a finish. For do-it-yourselfers, the best approach is to use a stiff-bristle brush threaded onto a broom-length handle, and a bucket of TSP dissolved in water. Following manufacturer precautions, scrub the deck surface, including the railings and stairs, then rinse with a hose. You may use a pressure washer to clean your deck, but I find that for this job it’s usually not worth the bother. In addition, if your deck surface has suffered from UV radiation or minor decay, a pressure washer may cause further damage by lifting splinters and slivers. If you’d like to brighten your deck or change its color, look into a cleaner formulated for decks. There are specialized deck cleaners made for brightening and for removing old tints and semitransparent stains. There are even deck strippers made for removing latex and oil-based solid color stains—but it’s a lot easier just to cover the old finish with a fresh coat of solid color stain! Now allow the deck to dry. Depending upon the weather and the finish you’re using, it may take several days. In my case, I had to let the deck dry three days before applying the oil-based semitransparent stain. If I had selected a water-based finish, drying would have taken less time. Be sure to follow the directions on the can. 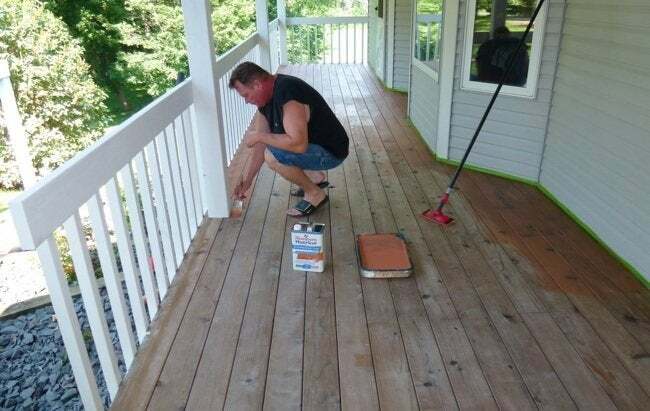 I like to use a 12-inch roller to coat large horizontal areas, such as a deck, and a small roller to apply finish to balusters and to top and bottom rails. Do not over apply; spread all excess sealer evenly until the roller is “dry,” and then reload. Have a brush handy to apply finish to tight spots. Avoid lap marks by maintaining a wet lead edge. The Thompson’s® WaterSeal® Waterproofing Stain is pretty forgiving in this regard as long as you follow the product directions and don’t work in direct sunlight. Doing so will dry the finish too quickly. This not only makes lap marks more likely but limits penetration into the wood you’re trying to protect. Early morning and late afternoon are good times to work as long as the temperature is going to stay between 50 and 95 degrees F. Out of the can, the desert brown waterproofing stain looks a lot like chocolate milk. It dries, however, to a translucent golden tan. I applied two coats because I wanted a deeper color. Otherwise, according to the manufacturer, one coat will suffice. A nice surprise was that the brush could be cleaned with soap and water. Roller cover and rags, however, had to be disposed of by placing them in a water-filled container to avoid any chance of spontaneous combustion. If you have a wood deck in need of some attention, the solution may require nothing more than a simple cleaning and easy-to-apply waterproofing stain finish. This post has been brought to you by Thompson’s® WaterSeal®. Its facts and opinions are those of BobVila.com.